As you may remember, this week Bloomberg reported about the fact that Apple is working on a new iPhone with a 2.3" screen. Today this information was also confirmed by the Wall Street Journal. "One of the people, who saw a prototype of the phone late last year, said the device is intended for sale alongside Apple's existing line. 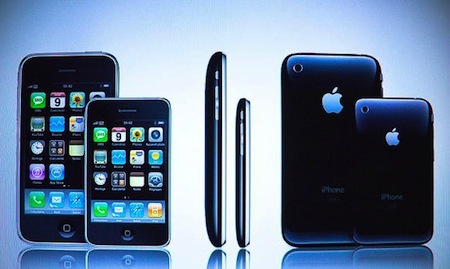 The new device would be about half the size of the iPhone 4, which is the current model. The new phone would be available to carriers at about half the price of the main iPhone repertoire. " The latter allows to suggest that this summer we'll see iPhone 5 at usual price of $199/$299, discounted iPhone 4 at $99, and iPhone Nano at $49. The newspaper also revealed some interesting details on the design and characteristics of the new iPhone. "The person who saw the prototype of the new iPhone said the device was significantly lighter than the iPhone 4 and had an edge-to-edge screen that could be manipulated by touch, as well as a virtual keyboard and voice-based navigation. The person said Apple, based in Cupertino, Calif., also plans to upgrade the iPhone 4." Voice-based navigation, which was expected to appear only in iOS 5, along with edge-to-edge screen support previous rumors that new iPhone won’t have Home button. Besides that, The Wall Street Journal reported that a MobileMe overhaul is also one of the top priorities for Steve Jobs in 2011. "Apple is considering making MobileMe a free service that would serve as a "locker" for personal memorabilia such as photos, music and videos, eliminating the need for devices to carry a lot of memory, the people familiar with the situation said." Practically that means that MobileMe will allow to stream iTunes libraries directly through the cloud with no need of a Mac or PC at all. The cloud will possibly be relying on the data center in North Carolina. Apple was planning to update MobileMe last year, but now both the release of so-called iPhone nano and new Mobile Me are on track for a summer release.